Atheist Ireland welcomes the published wording of the proposed amendment of the Constitution on around 25 October to repeal the offence of blasphemy. Atheist Ireland will be meeting this afternoon with officials in the Department of Justice, to clarify any technical or logistical questions that we have. We will then commence our fourteen-week campaign in support of repealing the offence. We have already held an initial planning meeting in Galway with the Ahmadiyya Muslim Community of Ireland, who also support repeal. We support the right of everybody to hold their religious or nonreligious beliefs, and to have their safety as individuals protected by the law. We also support the right of everybody to criticise the content of religious or nonreligious beliefs. If you would like to help with our campaign, please email us at humanrights@atheist.ie. Professor David Nash of Oxford Brookes University, an expert on blasphemy laws internationally, will be attending our meeting with the Department of Justice today. Professor Nash has attended previous meetings with Atheist Ireland at the Department of Justice, the Constitutional Convention, and the OSCE. Atheist Ireland has been campaigning on this issue since we were founded ten years ago, which coincided with the new law against blasphemy that was introduced in 2009. We have consistently raised the issue with successive Irish Governments, as well as at the United Nations, Council of Europe, and OSCE. We are pleased that the proposed wording is a simple repeal of the offence from the Constitution. That is the approach that we have consistently asked the Government to take. This will enable the Government to introduce the changes needed to remove the offence of blasphemy from our statutory laws. This includes repealing Sections 36 and 37 of the Defamation Act 2009, as well as amending the Censorship of Films Act 1923 to remove the word ‘blasphemous’ from the phrase ‘indecent, obscene, or blasphemous’. While the new blasphemy law has not been formally enforced so far, we know that some media outlets choose to self-censor themselves, rather than get involved in even the chance of a blasphemy case being taken against them. The Venice Commission, the body of European lawyers that advises the Council of Europe on constitutional matters, has said that the purpose of any restriction on freedom of expression must be to protect individuals, rather than to protect belief systems from criticism. It has said people must be able to criticise religious ideas, even harshly and unreasonably, and even if it hurts other people’s religious feelings, as long as they do not advocate hatred against an individual or groups. The Venice Commission says that democratic societies must not become hostage to the excessive sensitivities of certain individuals, and that freedom of expression must not indiscriminately retreat when facing violent reactions. Instead, the level of tolerance of these individuals and of anyone who would feel offended by the legitimate exercise of the right to freedom of expression should be raised. It says that democracy must not fear debate, even on the most shocking or anti-democratic ideas. It is through open discussion that these ideas should be countered and the supremacy of democratic values be demonstrated. Mutual understanding and respect can only be achieved through open debate. Persuasion, as opposed to ban or repression, is the most democratic means of preserving fundamental values. The law has also damaged Ireland’s reputation abroad, and contributed to the persecution of Christians, atheists, and members of minority faiths in islamic states such as Pakistan. 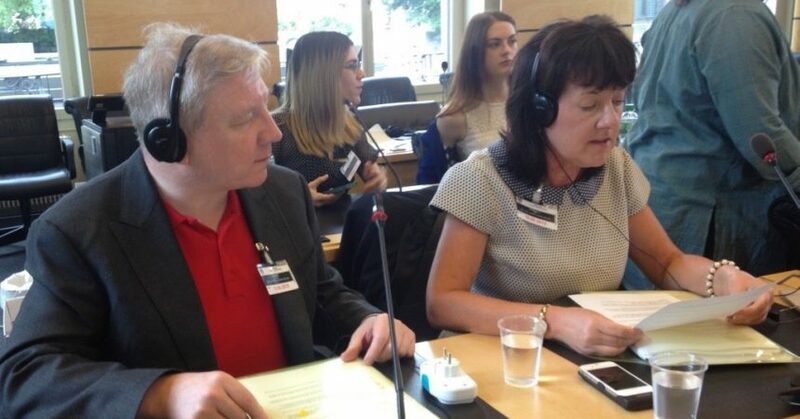 Islamist States at the United Nations, led by Pakistan, have called for the wording of Ireland’s law to be introduced internationally, in order to bolster their own laws against blasphemy and apostasy. In Pakistan, a Christian mother, Asia Bibi, currently faces execution for blasphemy, and Ahmadi Muslims are persecuted because they have different Islamic beliefs to the Sunni majority. After today’s meeting with the Department of Justice, Atheist Ireland will commence our fourteen-week campaign in support of repealing the offence of blasphemy.